Explore Spirae Wave for minimizing costs and maximizing benefits. 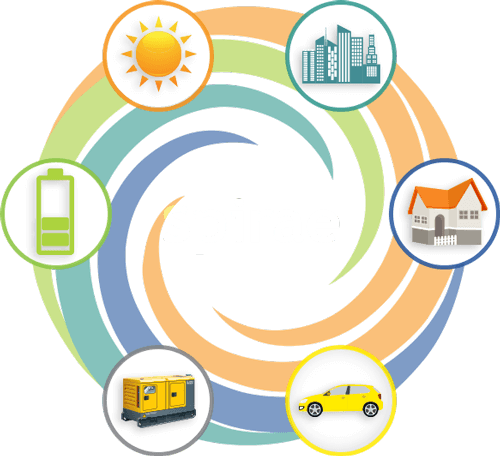 Spirae is an innovative technology company that delivers solutions for energy infrastructure digitization and decarbonization. We specialize in intelligent software for easily integrating and managing renewable and distributed energy resources for end-use and smart grid solutions/management applications. We enable vendor- and technology-agnostic DER integration, scheduling and dispatch, energy storage management, facility energy management, and on-grid and off-grid microgrids. The transformation of the electric grid promises a more efficient, reliable, green, secure and service-centric power system. Wave® also supports custom application development, operations verification prior to field implementation using modeling and simulation, and efficient field deployment. Wave is based on a distributed control strategy that makes it easy to integrate any type of distributed energy resource (generation, storage or loads), visualize and monitor assets, and optimally dispatch them for different applications. An ever-expanding Wave Asset Library converts any Distributed Energy Resource into a “plug and play” asset for Wave. the system in monitor and/or control modes. Authorized Wave operators visualize, monitor and control the system locally or remotely using client software. System control and asset dispatch are carried out manually, scheduled ahead of time, or performed automatically to meet specific objectives. Wave handles resource availability, dispatch conflicts, and changes in operating conditions automatically with asset reservations functions and closed-loop control algorithms.